GSG Expo Updates: Is your Productivity Rate flat-lining?! Is your Productivity Rate flat-lining?! As stated here many times, good productivity is vital to the health of your mattress manufacturing business. It is one of the purest measurements of your company's success because it weighs the true product value you get out of the resources you invest in your business. The chart below shows the Productivity Index Rate specifically for Furniture Manufacturers (NAICS code 337) from 1996 to 2016. Overall, we've come a long way, but that's not all it tells us. Twenty years ago the productivity rate was expanding very rapidly, and though it is still showing some growth, it has become relatively flat in recent years. Obviously many impacting factors come into play; changes in product value, employment levels, just to name a couple biggies. So you can really improve your productivity rate by raising the selling price of your final product, and if you can do that - more power to you! Instead, most manufacturers are being pressured to competitively reduce their selling price, so that makes productivity improvements even more valuable than ever. Global Systems Group has developed many new technologically advanced mattress machine systems to keep your factory from flat-ling. Multi-tasking operations (more work from less labor) can quickly point your productivity rate upwards. 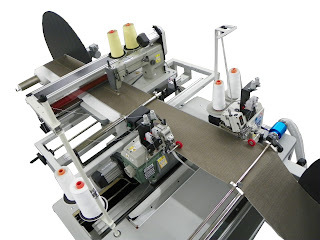 This Porter PE-504/DO is a roll-fed serging machine to overedge each side of border material AND it can automatically add flange behind the serging operation. This improves your worker's productivity in two ways! Since it is fully automated, your worker can perform another operation while this process is working, and the additional flange attachment eliminates that downstream operation altogether. The Gribetz DST-60 robotic quilt panel de-stacker automatically loads panels into the flanger workspace without any need for operator labor. Reducing non-value-add touches is another valuable productivity factor because it keeps your worker focused on improving product value rather than sucking value out with unnecessary labor tasks. 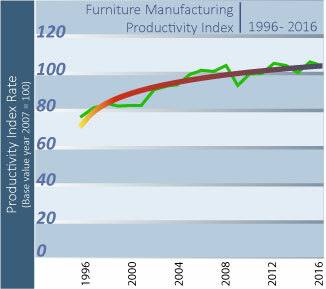 Don't fall behind the curve in the area of factory productivity. 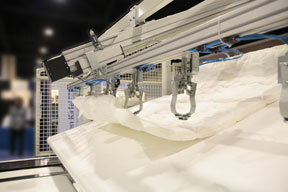 Visit the GSG website, www.gsgcompanies.com, to find many more high-production systems for your mattress factory.